Mia Leech won four gold medals. 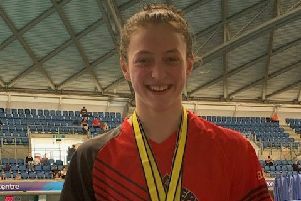 Mia Leech led the gold rush when 19 members of the City of Peterborough Swimming Club (COPS) travelled to Aldershot to compete in the Rushmore Royals Open meet at the weekend. The 13 -year-old won gold medals in the 50m and 100m breaststroke and the 200m and 400m individual medley events and she also picked up a silver medal in the 200m breaststroke. Altogether COPS won 23 medals - six of them gold, 10 of them silver and seven bronze. The two other golds were won by Holly Jaszkiewicz (14) in the 400m freestyle and individual medley events. She also bagged silver medals in the 200m backstroke and individual medley and a bronze in the 200m freestyle. Thirteen year-old Sophie Crowther took a silver medal in the 400m individual medley and a bronze in the 100m and 200m breaststroke while Lauren Harrison claimed silver in the 400m individual medley and a bronze in the 200m breaststroke in the 15 years age group. COPS other silver medal winners were: Mollie Allen (17) – 100m back; Taylor Goodby (17) – 200m fly; Joshua Graves (18) – 400m individual medley; Myles Robinson-Young (14) – 400m free; Harriet Salisbury (11) – 400m free. Anna Blakeley (13) completed the medal haul with bronze medals in the 50m freestyle and the 200m individual medley events. Also competing for COPS were Hannah Brigham (18), Michael Lardner (16), Emma Leslie (15), Charlotte Martin (13), Henry Pearce (13), Will Steel (14), Madeline Todd (11), Christie Woods (15) and Eve Wright (12).